It’s the game of the season - Liverpool play host to arch rivals Manchester Utd at Anfield and Kilkenny People has teamed up with the Central Station Hotel in Liverpool to offer an exclusive package to one lucky winner. One lucky winner will get flights from Dublin Airport, tickets to the game plus two nights stay in this plush, city centre located hotel so you can not only cheer on your favourite team, but you can also take in some of the sights of this wonderful city. What is the name of the bar at the Central Station Hotel? 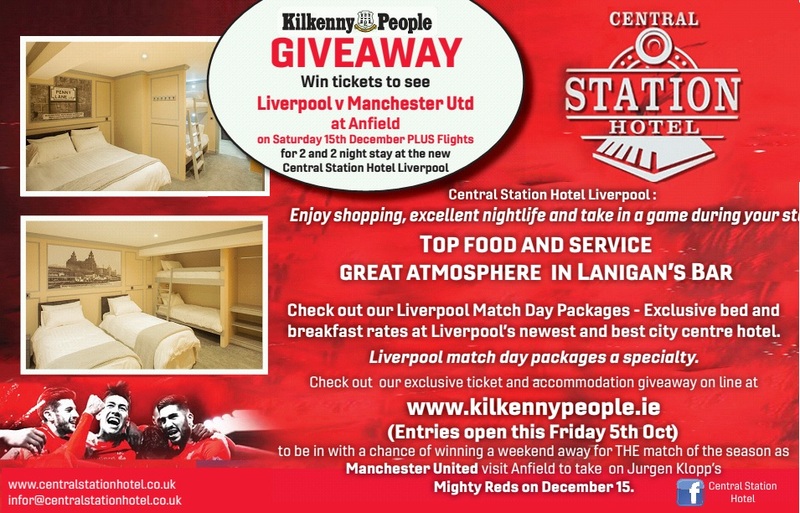 You can check out the Liverpool match day packages on their website at www.centralstationhotel.co.uk. Don't forget to check out their accommodation offers which include an exclusive bed and breakfast rates at Liverpool’s most modern hotel.